A company is mourning what it calls the "needless destruction" of a Russian satellite that was deliberately brought down over the Pacific Ocean despite its potential to be recycled to serve scientists in Antarctica. Russian spacecraft controllers intentionally plunged the defunct communications satellite, called Express-AM4, into the ocean on Sunday (March 25). The $265 million satellite was launched into the wrong orbit in August and had been languishing in space ever since. Months before the satellite's fall, the company Polar Broadband Systems Ltd. tried in vain to save and recycle the Russian satellite, company officials said. "Polar Broadband mourns the needless destruction of Express AM4," company officials said in a statement on Sunday. "Repurposing Express AM4 represented possibly a once in a lifetime opportunity to further science, operations and safety in the Antarctic for the coming decade and beyond." But while the company had been discussing this idea with Russia for months, their appeals were ultimately ignored. 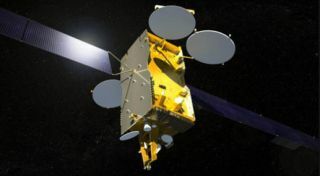 The European aerospace firm EADS Astrium built Express-AM4 for the Russian Satellite Communications Company. The satellite was designed to have a 15-year lifespan. Express-AM4 was launched atop a Proton rocket on Aug. 18, 2011, but a failure of the rocket's upper stage prevented the satellite from reaching its planned geostationary orbit 22,369 miles (36,000 kilometers) above Earth. Without enough fuel to boost it into the correct position, the satellite remained stranded in an orbit that was too low to fulfill its duties. Dennis Pivnyuk, chief financial officer of the Russian Satellite Communications Company (RSCC), which is responsible for the country's federal TV and radio broadcasts, announced earlier this month that the Express-AM4 telecommunications satellite would be intentionally guided through Earth's atmosphere. Any surviving pieces would fall into the Pacific Ocean, he added. The satellite has been in the wrong orbit since August, but was not damaged. Still, Russian officials said that from its erroneous orbit, Express-AM4 had been exposed to harmful radiation in space, and while several plans to salvage the satellite were reviewed, none were deemed feasible. But officials at Polar Broadband disagree. "Neither of the rationales used for deorbiting Express AM 4 — radiation dose received while stranded in its transfer orbit or risk of collision with other satellites — were applicable to our Antarctic mission orbit," company officials said. "The deorbit of the Russian satellite Express AM4 is a tremendous loss to the entire international scientific community and most particularly, those personally conducting scientific research in the harsh and unforgiving environment of the Antarctic." Despite Express-AM4's ultimate demise, Polar Broadband officials say they will continue to look for opportunities to extend the lives of satellites, and to enhance communications services in Antarctica. "While we are disappointed in this outcome, we hope that the attention brought by our proposal will cause satellite owners to think more carefully about repurposing assets in the future when similar circumstances arise," they said. "Nevertheless, Polar Broadband Systems, Ltd. remains committed to pursuing opportunities to bring 21st century broadband communications to the Earth's polar regions."